Unless you’re paying cash, one of the very first steps in purchasing a home is getting established with a lender. If you have a list of questions to ask your lender, you’ll be more prepared. Here are some to consider when obtaining a mortgage. You may be surprised that there could be more than one option that would better fit your needs. A reputable lender will want to gather as much information about you as possible before recommending a particular loan. You wouldn’t want a dentist to start drilling without taking an x-ray, right? Check out this guide to mortgage types to catch you up to speed. This question is an obvious one with most home buyers but there’s more to it. First of all, depending on your loan type, you could have a fixed rate or an adjustable rate. A fixed rate will be the same from the first day of your loan until the last day of year 30. An adjustable rate is just that. It will change over the course of your loan. For any type of interest rate, be sure to ask the lender about additional fees, if any. For adjustable rates, ask your lender how often the rate is adjusted, what is the maximum cap on the rate, and what is the maximum annual adjustment. Asking this question will let you know quickly which lender will save you the most money. So what’s the difference? An interest rate is the cost of borrowing the principal loan amount. The APR is an expanded measure of the cost of the loan because it not only includes the interest rate but also discount points, broker fees, and some closing costs. So, if Bank A and Bank B both offer you an interest rate of 5%, their APR could very much be different. Even a 1/4% difference could mean thousands of dollars over the life of the loan. Well, obviously lenders will want to see as much down payment as possible but you do have options. Depending on your loan type and your situation, you could have options of 0%, 3.5%, or 5%. See the link above on mortgage types for more detail. What are the origination fees and discount points? Origination fees are paid directly to the lender at the closing table. The amount of the fee is at the sole discretion of the lender but it’s typical to see a loan origination fee of 1% of the loan amount. I have seen flat fee origination fees of $975 and I’ve seen 0% fees in our area. The lower the better of course because this is cash out of your pocket at closing. You do have the option to pay down your interest rate by buying discount points. A point equals 1% of the loan amount. So, if your interest rate was 5% on a loan amount of $200,000 and you pay for 1 point, your interest rate would be 4% and cost you $2,000. What are all of the costs involved in getting a loan? Some of these costs can sneak up on you if you’re a first time buyer or haven’t bought a home in awhile. As a Realtor in lower Alabama, we are required by state law to give our clients an “estimate” of closing costs. On the other hand, by federal law, lenders are required to provide you with a Loan Estimate that is more precise. Go to this site to see Closing Costs Explained. Do I have to pay Private Mortgage Insurance? Private Mortgage Insurance (PMI) is required when your down payment is less than 20% of the appraised value of the home. You’ll need to ask your lender how much it will cost and is it a monthly charge. Once you’ve paid down your mortgage to 80%, you can ask your lender to eliminate PMI. Side note: There may be other programs that you qualify for where there is no PMI. 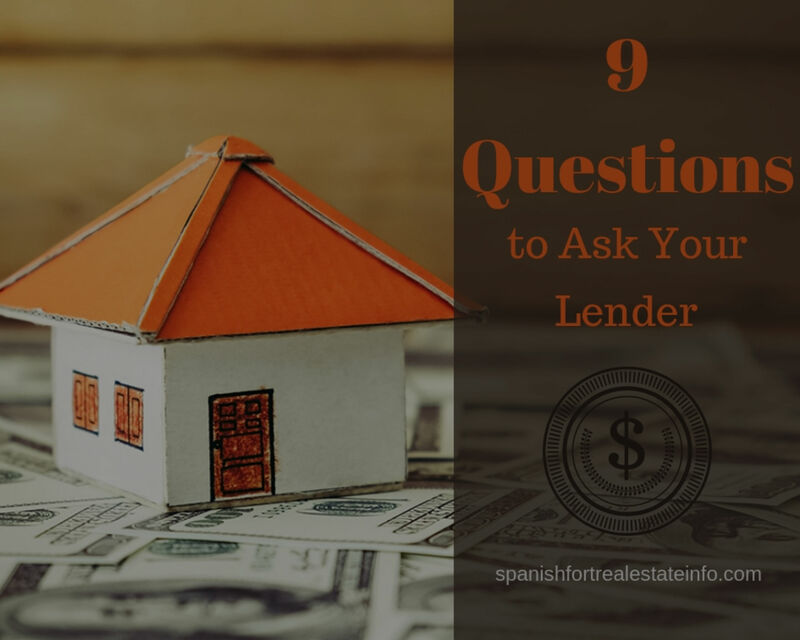 Ask your lender. This is an obvious question but here’s something to consider. There are hundreds of mortgage calculators online and many future home buyers use these to determine what their mortgage payment will be. Caution! These calculators are great but they only give principal and interest. You’ve probably heard of PITI which stands for principal, interest, taxes, and insurance. Use these calculators but just know that you’re actual payment will be a little higher. Your lender will be able to give you an accurate figure for what you’ll pay every month. How long will it take to close on the loan? Some banks may tell you 3 weeks and some may tell you 45 days. There’s a lot of factors that come into play but for the most part, figure on around 30 days. The underwriter will analyze your credit, assets, and cash at the beginning of the process and at the end. Be sure not to make any major purchases or changes in your life during the contract period. This could push back on how long it takes to close your loan.